Intel Kaby Lake is the last iteration of Intel’s 14nm micro-architecture and according to a report from Benchlife.info it is expected to debut quite soon – by September this year. It is also the first “Optimization” step in Intel’s brand new PAO (Process, Architecture, Optimization) philosophy that has seen Moore’s Law been put to rest (or drastically redefined depending on your preference of syntax). 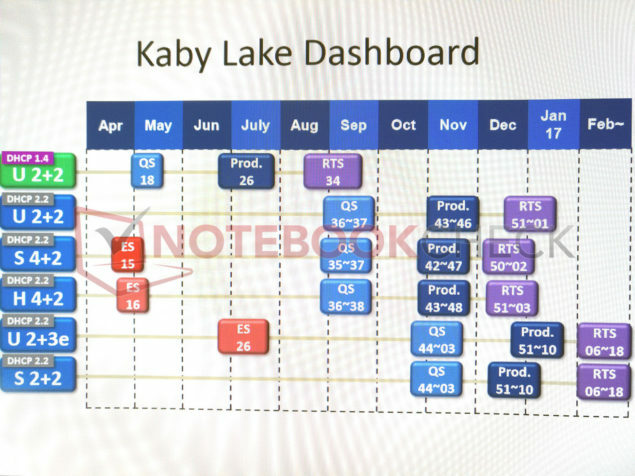 According to the report, Kaby Lake is expected to debut with the KBL-Y aand KBL-U series. You might remember that the series lineup of Kaby Lake has already leaked out. KBL-Y will be coming in 4.5W flavors while as KBL-U will extend up to 15W TDP. 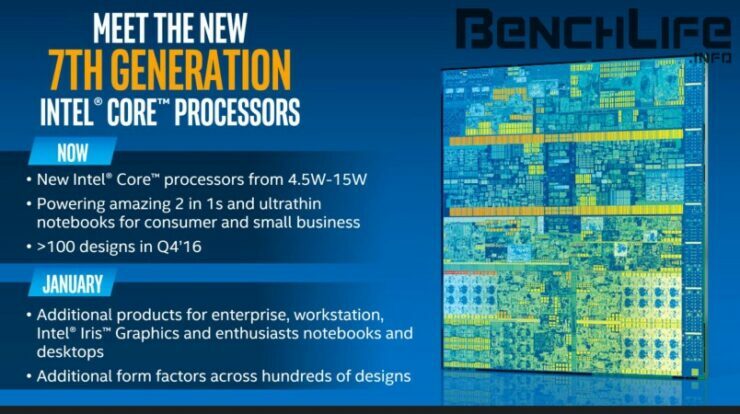 This is of course the TDP envelop for 2-in-1 and notebook designs and as always Intel will be rolling out the architecture to the mobility market first. Kaby Lake architecture will introduce quite a few ‘optimizations’ over Skylake; and a new media engine is one of the few things explicitly mentioned in the slides. 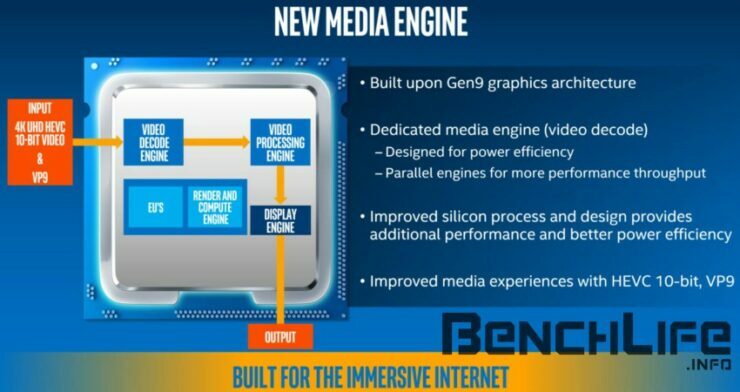 Featuring a Gen9 graphics architecture, the new iGPU will be able to support hardware based HEVC 10 bit (4K UHD) and VP9 decoding. As far as actual performance gains go, we don’t expect them to be significant over that of Skylake variants. The first thing we mentioned was the S 4+2 category – which is the shorthand for the mainstream quadcore variants by Intel. According to the roadmap this is going to be landing in December this year. Also notice the fact that this has DHCP 2.2 stated in the top label – which means HDMI 2.0 is going to be fully supported. In this category we have two “K” series models. These chips have an unlocked design that indicates that they are built for overclocking. The flagship is the Core i7-7700K features 4 cores, 8 threads and 95W TDP. The Core i5-7600K is a quad core chip without multi-threading support that packs 6 MB of L3 cache and a 95W TDP. Then there are four standard models which include the Core i7-7700, Core i5-7600, Core i5-7500 and the Core i5-7400. TDP on this model is set at 65W along with 8 MB of L3 cache. 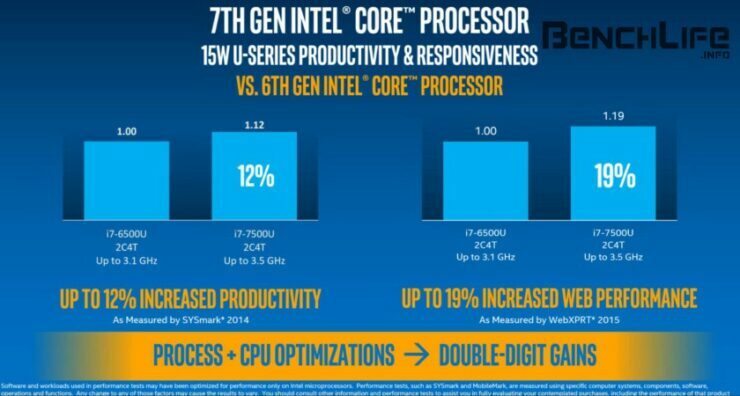 Rest of the three Core i5 models are quad core variants without multi-threading support. Then comes the S 2+2 category – which are the dual core Kaby Lake processors. These are going to hit the market sometime in February 2017. The Core i3 variants are probably going to be included in this particular roll out. The “H” series is the prefix for Intel’s high end mobility processors and will be landing in December as well in Quad core flavors. That leaves only the U series behind. The U 2+3e is the denotation for Iris Pro equipped processors (the ‘e’ stands for eDRAM) and the “U” stands for the ultra low power flatform. The U 2+2 series is landing in September this year as well as later on in December but the Iris pro equipped processors will be coming February 2017. Keep in mind that Cannonlake architecture based on the 10nm platform is expected to land in 2017 as well (word on the rumor mill is that this should happen by late 2017) and will bring significant performance increase over KBL due to the transition to a significantly smaller process node. Due to the difficulties faced by Intel in trying to shrink nodes however it is quite probable that this date gets delayed to early 2018.